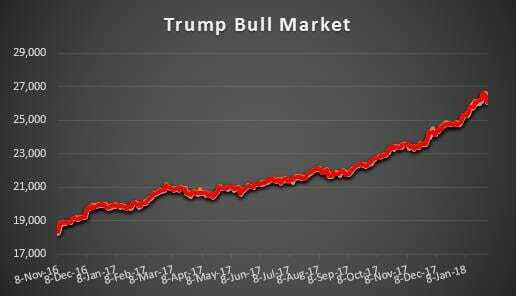 Liberal MSM Gleefully Reports that Markets Fall for 2nd Day in a Row=> Now Only Up 42% Since 2016 Election! 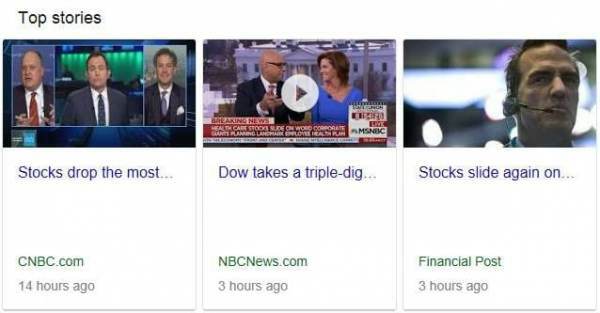 After two days of stock market losses the MSM is happily announcing that the market is falling. The market is down 540 points over the past two days. But overall the Dow is up over 42% and more than 7,700 points since the 2016 election! Today the Dow was down 362 points and 540 over the past 2 days. This is perhaps the worst 2 days in the markets since President Trump was elected President. Left wing pundits gleefully shared the news. But what the MSM is not telling you is that the markets since the 2016 election are on fire. This month alone the markets are up more than 1,300 points! The markets stood at 24,719 on December 31, 2017, and today they landed at 26,076. President Trump gave a speech last week at Devos to world government, academic and business leaders at the World Economic Forum. He stated in his speech that the US stock markets are up due to his policies and programs where the markets would be down by the opposite amount had Hillary won! President Trump is right. He stated that US markets are up by nearly 50% since his election. (The Dow is up 42% since the 2016 election as of today.) He also stated that the markets have hit 84 all time highs since the election. He actually understated the correct amount. As of today, with the Dow reaching another all time high, the Dow reached its 99th all time high since the election. Next month Americans will receive more money in their checks due to lower taxes from the Trump Tax Cut law just passed. As time goes by, Americans will see more and more the blessing that President Trump won the 2016 election. The markets are actually doing very well. Thanks to President Trump.